The amount of memory to allocate depends on the application, as well as the size and complexity of the project. If you are experiencing performance problems with Insight, contact us at support@dug.com. Open the DUG Insight Launcher. Choose the application to configure. The most recently used value is chosen by default. If you haven’t run Insight before, a sensible value is chosen automatically. Choose a value from the list, or enter your own choice. Leave 1-2 GB free for the Operating System. A warning appears if the memory entered is more than is available on the machine. 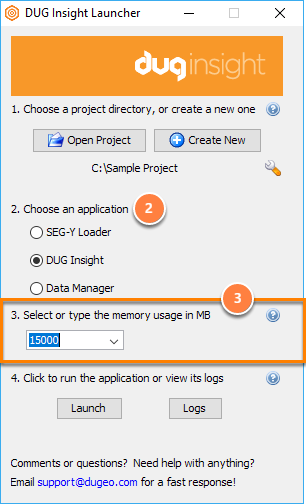 The SEG-Y Loader converts SEG-Y files into Insight’s high-performance dugio format. It does not require much memory and around 1000 MB should be sufficient. In general, Insight runs better with more memory allocated. We recommend giving Insight as much as possible, leaving 10% (or 2GB, whichever is larger) available for other processes. e.g. if you have 16 GB total RAM (16,000 MB) in your machine, allocate up to 14,000 MB for Insight. Insight carefully manages its use of memory to get the best results. Generally, it caches data that is displayed or recently accessed. When work is done on-the-fly, the results are kept in memory for reuse (as much as possible). This one of the secrets to Insight's speed when working with huge regional 2D and 3D projects.